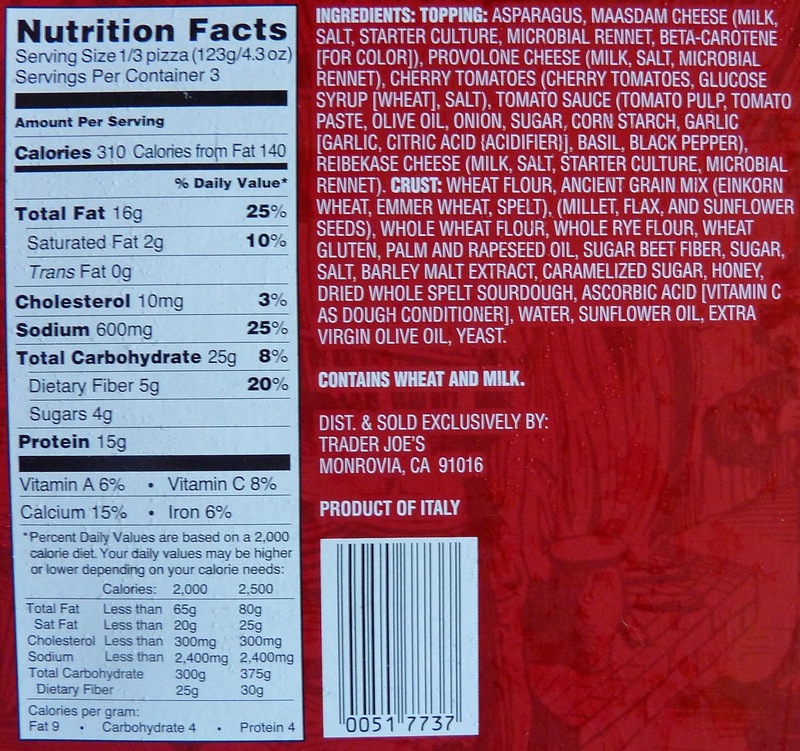 When a bag of grains has been sitting in Trader Joe's warehouse for a couple years, instead of wasting it, they stick it in one of their products like this pizza, a loaf of whole grain bread, or a tub of hearty Lentil Soup. The word "ancient" is actually a subtle disclaimer that lets you know these grains have been around for a while, as required by the FDA. 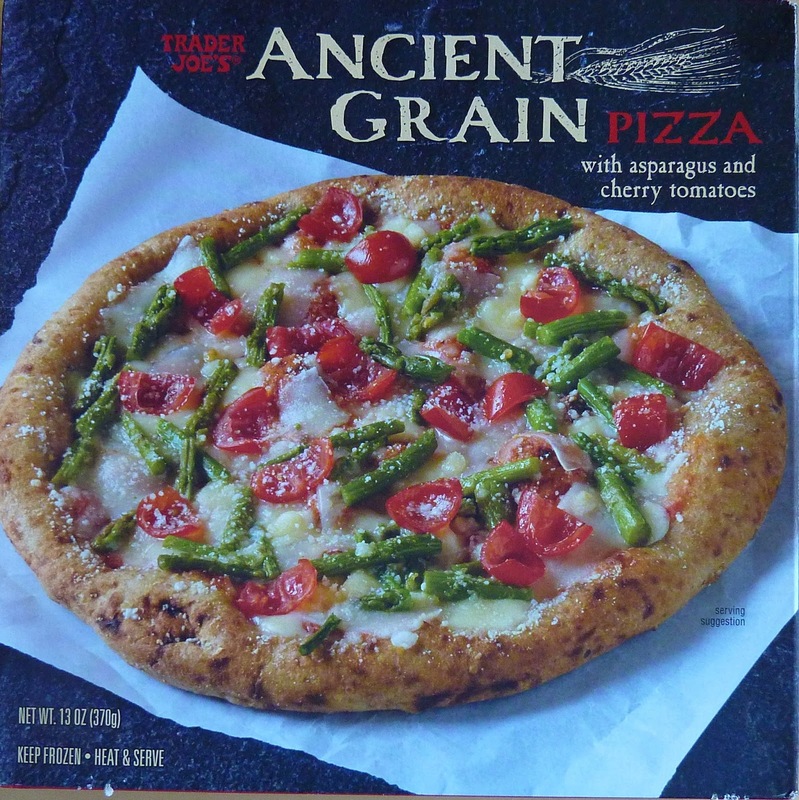 It's either that or "Trader Joe's Really Old Expired Grains Pizza," so of course they go with "ancient." I hope that most of you have realized by this point that the previous paragraph is entirely ridiculous, fictional, and hopefully mildly amusing. If you want to read about the ancient grains trend as well as the inevitable backlash against it, click here. I won't even pretend I know about all that stuff. When choosing food at Trader Joe's, my mental process goes something like this: "Ooh! Ancient Grains! Something about asparagus! This is potentially better for me than a McDonald's cheeseburger! I'll take it!" But seriously though, pizza doughs featuring einkorn, emmer, and spelt—or any grains that automatically get red lines beneath them from spell check (which all three of those did)—inevitably give rise to more interesting conversations than pizza doughs made exclusively with wheat. Which brings me to my first point and major complaint about this product: why go to all that trouble to build a time machine, go back to the ancient Fertile Crescent to raid unsuspecting Mesopotamian farmers, take their unique grains back through the stargate with you, all the while risking hazardous temporal paradoxes that could negate your very existence, just to pollute your ancient grain medley with wheat flour? That's right folks, "wheat flour" is the main ingredient in this pizza's crust. I mean, really TJ's? Either you're playing some cruel trick on gluten-sensitive people, or einkorn, emmer, and spelt just really don't taste that good by themselves. I thought the ancient grains were the main attraction of this product. Apparently not. So that's definitely something working against this product. Another weakness was the texture of the veggies. Sonia and I both agree that asparagus might have worked had they only used asparagus tips. But there were no tips. Just stalks. And even the best asparagus stalks are a little chewy/stringy. These were no exception, though I must note that they tasted fine and made a decent side dish when removed from the pizza. Also the tomatoes were a bit too chunky. Both Sonia and I would have preferred fewer/smaller tomatoes and more of the tomato sauce, which was spread quite thin, but tasty. And Sonia is a huge fan of whole raw tomatoes, while I am definitely not. I love tomato sauces, soups, and derivatives, but not the fruit itself. So for me, it was partly a taste thing, while for Sonia it was more about texture. So there are a few weaknesses with this pizza for sure. But there was enough good stuff going on that we enjoyed it overall. Wheat or not, the crust was very good. It kinda reminded me of Trader Giotto's Whole Wheat Dough. 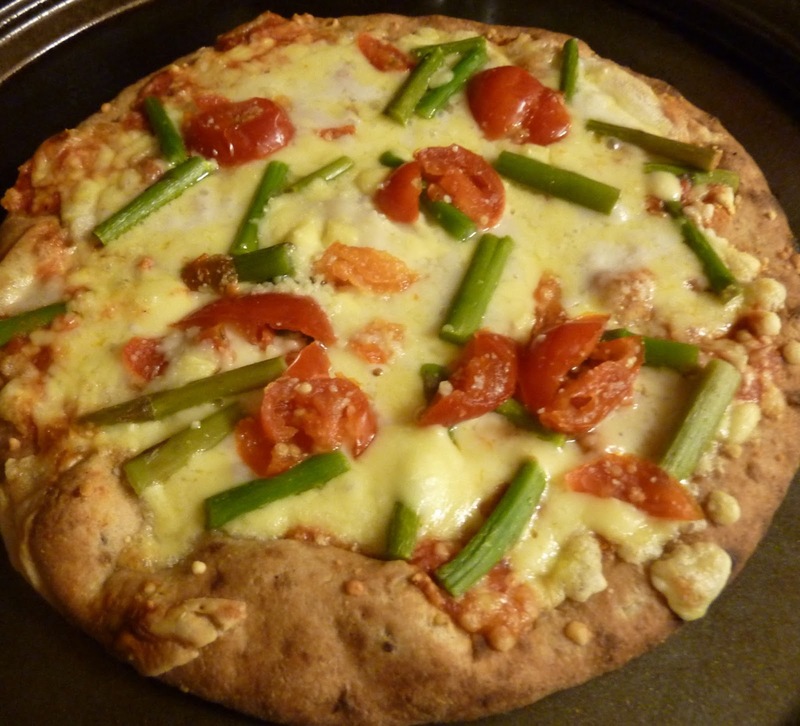 It was nutty, hearty, and had a bit more body than ordinary pizza crust. And it went perfectly with the delicious blend of cheeses: provolone, maasdam, and reibekase. The cheese and the crust by themselves were amazing. Sonia and I got to talking about what toppings, if any, would have enhanced this crust/cheese combo. We decided some crisp sliced peppers wouldn't have been bad, or maybe even some fake meats. All in all, it's a unique pizza with excellent crust and cheese, but we weren't thrilled with the selection of toppings. Plus, we're not sure why they didn't go the gluten-free, wheat-free route. Double 3.5's for this one. FYI Guess what einkorn, emmer, and spelt really are? You guessed it. Ancient varieties or ancestors of wheat. All three are forbidden are gluten-free diets. As someone who nearly died from malnourishment before being diagnosed with celiac disease, the ancient grains movement makes me mad. It sounds like this should be something we should be embracing and it is death on a pizza. Just wanted you and your readers to know. By the way, gluten-free can never be just a fad. There are too many of us with life-threatening symptoms who cannot afford to ever come into contact with even a whiff of gluten. Thanks for all your wonderful reviews. I downloaded TJ's gluten-free list and am looking up all their products here before I spend money on them. Many are not actually labeled gf, they are naturally that way. That's great info, David! Thanks. I certainly didn't mean to make it sound like gluten-free was a fad. Ancient grains, yes. But trust me, I've known multiple people with Crohn's or celiac disease, and I suffered from wheat allergies when I was a kid. I'm actually still a little sensitive to wheat, but I know it's not even an option for you guys. We'll try to keep doing GF reviews. Feel free to leave a comment if we ever review something that's GF that we didn't label as such. Thanks again for your input and for commenting. I'm reading this review whilst eating some of this pizza and I don't think I feel quite so fondly as you guys did. The crust burned very easily (12 min, around the edges), and seems quite dry to me. I'm eating it with soup, but otherwise I agree that there could be more tomato sauce. Got some asparagus tips in mine... It doesn't "make" the pizza. I probably won't buy this again, but it's not awful.